When can I login to The Dignity Planner™? Where can I find my Simplicity Plan? Can I add to and edit my Simplicity Plan? Do I have to pay for The Dignity Planner™? No. The Dignity Planner™ is a free service provided by the Dignity Memorial® Network, Inc. The Dignity Memorial network of funeral and cemetery providers includes affiliates of Service Corporation International. Will I be able to go back to SimplicityPlan.com? No, SimplicityPlan.com will no longer be available after August 28, 2015. We will transfer your plan into your account at The Dignity Planner™. 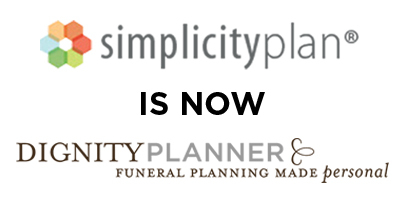 You will login to The Dignity Planner™ to view your Simplicity Plan or create a new Plan for you or a loved one. See the question below for details on what we transferred. Will I be able to do the same thing in The Dignity Planner™ as I did in Simplicity Plan? Yes. If you had an existing provider selected in Simplicity Plan, that will be carried over into your plan in The Dignity Planner™. When you create new plans, you can view Dignity Memorial providers, which may include former Simplicity Plan provider locations. No. If you had vital statistics in your Simplicity Plan, that will not be carried over into your plan in The Dignity Planner™, and is not supported. We want to enhance your experience by protecting your privacy. Yes. Under My Plans section and in the Plan Details in the left menu, you can designate a benefactor. Your plan from Simplicity Plan will carry over the existing designee information within your plan. No. If you had veterans information in your Simplicity Plan, that will not be carried over into your plan in The Dignity Planner™, and is not supported. We want to enhance your experience by protecting your privacy. No. If you had financial information in your Simplicity Plan, that will not be carried over into your plan in The Dignity Planner™, and is not supported. We want to enhance your experience by protecting your privacy. No. If you had this information in your Simplicity Plan, that will not be carried over into your plan in The Dignity Planner™, and is not supported. We want to enhance your experience by protecting your privacy. No. If you had insurance policies in your Simplicity Plan, that will not be carried over into your plan in The Dignity Planner™, and is not supported. We want to enhance your experience by protecting your privacy. No. If you had personal documents in your Simplicity Plan, that will not be carried over into your plan in The Dignity Planner™, and is not supported. We want to enhance your experience by protecting your privacy. The Dignity Planner™ does not allow document storage. Yes. We are carrying over this information, and you can construct your entire service including reception, burial site, services and more using The Dignity Planner™. You can share with friends and family for input, and share with funeral home for next steps. Yes. If you had an existing information in Simplicity Plan, that will be carried over into your plan in The Dignity Planner™. When you create a new plan, you plan provide additional information in My Thoughts under left menu.